Today Jamie and I met up with Lauren at the interminably-just-about-to-close Las Manitas on S. Congress for some lunch. Apparently, as we were circling to park and I was discussing parking options on the phone with Lauren, a hobo was making idle threats upon Lauren's person. We did not know this, and so when we jumped out of the car, Jamie gave the hobo a few quarters. So, you know, if you want to make some easy money by Jamie, just threaten Lauren a bit. After a delightful lunch, we headed to the Bob Bullock Museum (aka: The Story of Texas) to try to squish a bit more Texas pride into Lauren, who did not have the good fortune to be raised in The Friendship State. 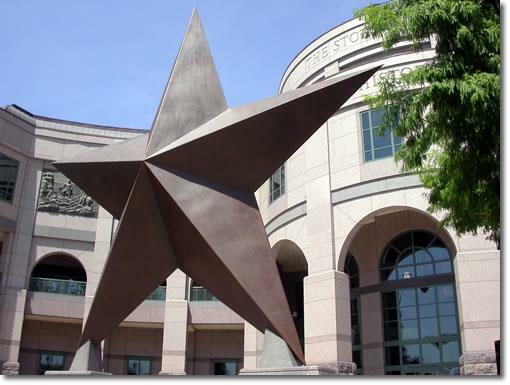 I should also comment how different the Bob Bullock Museum is from the Jim J. Bullock Museum, which doesn't exist (yet), but which I would endorse. I think it was a bit of a challenge for Lauren getting past the subtle delivery of the Bullock Museum to try to understand how Texans might feel about their state. Its a well-concealed message, but I think we were able to come away with a sense of the humble dignity Texans carry in their hearts. We enjoyed the Spirit of Texas Theater, which is a multi-sensory entertainment experience, in which they spritz water on your face for rain, put a low rumble under the floor for a stampede, and shoot off a piston to represent a snake surprise (a piston, which, in 2000 or so, when I went to see the same show and slouched, got to know me a bot more intamtely than I would have liked). They also really spin Texas history like crazy, sweep racism and institutionalized bigotry under the rug, and suggest that all those crazy Indians should have done was put on a tie, and everything would have been cool to begin with. We also went to the 3D IMAX, which was about an hour of new-age music, images of whales and dolphins swimming around, and Darryl Hannah's soothing voice DARING me not to fall asleep. 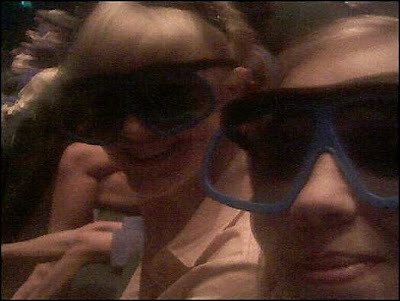 For the first time ever, Lauren is able to see things in 3D. Normally she sees objects in 4 dimensions. I like me some 3D IMAX action. But someone needs to tell children "hey, kids... these are not solid objects. You don't need to wave your arms and squeal everytime new objects appear on screen." The displays at the Bullock Museum are pretty good, but you sort of wonder if they mean much to the folks who weren't raised in Texas with the sort of basic level of understanding to really put the pieces together. For example: There are pieces of French and Spanish weaponry from the 17th Century, but there's no real context around those items. What were those guys doing? Did they succeed? The Bullock museum paints everyone as a good guy (expect the Mexican military of 1836), and that's somewhat problematic in explaining what was going on. There was also a mostly dismantled T6-Texan on the 3rd floor of the museum, which had the nose taken off so you could see the radial engine. Which led me to Wiki-search Radial Engine, and hey... now I understand how they work. I also confirmed the vast difference between a radial and rotary engine. Thanks, internet! We also toured the exhibit on the TV show, Dallas. Which, for legitimate reasons, Lauren believed to be a huge, permanent fixture. Which would be awesome, if true. Anyhoo, I hope Lauren got something out of this mess. I want to be unemployed. Unemployed people do fun stuff. yeah. It's a laugh a minute. You get to do more fun stuff than me. That's because I married The Most Fascinating Woman on Earth.